SkyWest investors were rewarded with another quarter of solid earnings growth. Shares of SkyWest (NASDAQ:SKYW) -- the largest regional airline operator in the U.S. -- have dramatically outperformed other airline stocks over the past two years. In fact, SkyWest stock has more than quadrupled since bottoming out in October 2014. SkyWest continued its hot streak last month as the stock soared 14.2%, according to data from S&P Global Market Intelligence. 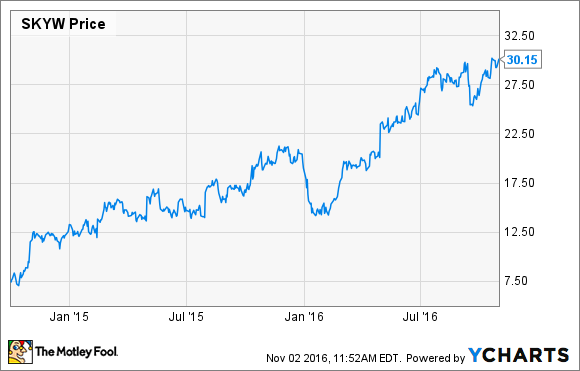 SkyWest Stock Performance, October 2014-October 2016. Data source: YCharts. SkyWest has managed to consistently beat analysts' earnings estimates over the past year. It did so again last week, reporting Q3 adjusted earnings per share of $0.90: 11% ahead of the average analyst estimate. The company is profiting from its position as the only regional airline with enough pilots to take on new contracts and enough cash to expand its fleet. For Q4, SkyWest does face some headwinds sinsce it plans to add 19 new Embraer (NYSE:ERJ) E175s to its fleet. It will incur some additional costs as it trains more pilots to fly the E175 and makes other changes to its fleet. This could continue into 2017, as SkyWest is scheduled to take another 17 E175s from Embraer in the first half of the year. SkyWest is adding lots of high-margin E175s to its fleet. Image source: Embraer. The long-term benefit is that Embraer's E175 is very popular with the legacy carriers that are SkyWest's customers. SkyWest's strong earnings growth over the past couple of years is directly related to the higher rates it can charge for flying the E175. SkyWest will have 103 Embraer E175s flying by mid-2017. It has only one more E175 on order beyond that. Thus, unless the company finds new opportunities to expand its highly profitable E175 fleet, earnings growth could slow after next year. Meanwhile, SkyWest shares now trade for more than 10 times forward earnings. That's fairly cheap compared to the broader market, but relatively expensive as airline stocks go. As a result, SkyWest stock may be running out of upside potential despite the company's solid earnings trajectory.